Whatever the circumstances may be, sometimes we need to wipe our phones of all of their content. Maybe you are getting ready to sell it through eBay or Craigslist, and whoever is buying your phone certainly doesn’t need to see all of your stuff on their new phone. So, how do you factory reset an Android device? 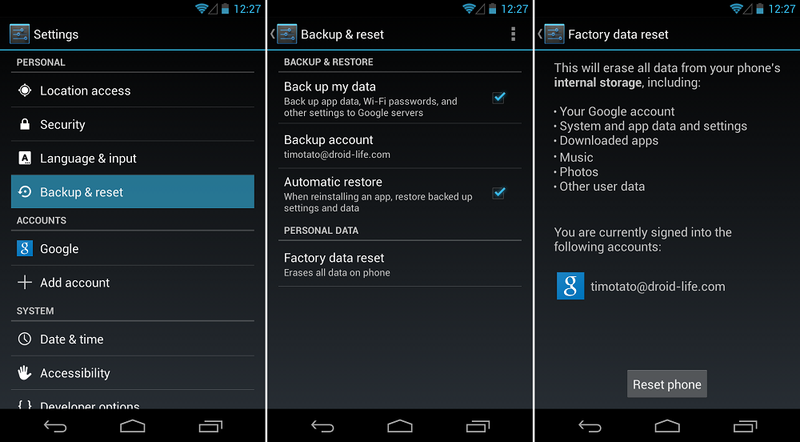 This guide will serve as a brief look into how to rid your phone of all of your personal pictures, documents, contacts, and more with the help of the built in reset option that Android offers. Note: If you select to factory wipe your device, all info will be wiped including contacts (unless they’re sync’d to your Google account), pictures, documents, and everything else. It returns the device to as it was when you just opened the box. Once hit, the device boots into recovery and wipes it clean. After it is done, it will reboot and your device will act as if it is brand new with all of its content gone. At this point, you can go ahead and do what you will with the device with no worries of anyone seeing those pictures you took in Vegas. It wouldn’t be Android if there wasn’t at least a few ways of doing things. For anyone running a manufacturer’s skin atop their Android OS, things sometimes look different. Also, depending on which version of Android you are running, the Reset option could be under a subcategory in the Settings menu. 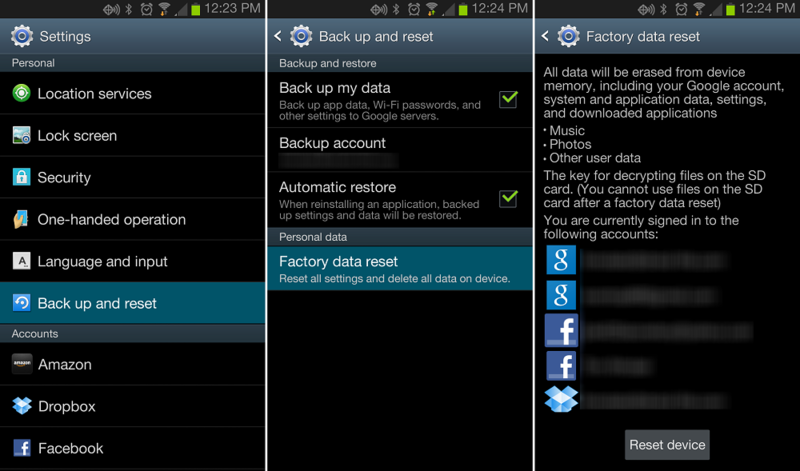 For example, for users on Gingerbread, the option to factory reset a device is under the “Privacy” settings menu. The above image is how you find this option using Samsung’s TouchWiz UI, which is almost identical to stock Android in terms of location.